Another race another demolition of the field by the ever imperious Lewis Hamilton, but that is not all there is to talk about from the race weekend, I have had my say below on some of the stories from up and down the pit lane from the race weekend. What Next For Red Bull? It has been well documented for some time that Red Bull want out of their Renault contract and with it looking more and more likely that Renault could be making a return to the sport as a constructor once again in a bid to take over the struggling Lotus team they could well get their wish. So this leaves us with the unanswered question as to what engine will they use? They have been keen for some time to come to an agreement with Mercedes for them to supply Red Bull with engines for the 2016 season but for that to happen Mercedes would have needed to know back in May in order to get the engine to Red Bull for February 2016. It was also leaked last night that Mercedes are not keen on being engine suppliers to Red Bull, no official word has been made from either side but this is what the paddock feels. So that leaves Ferrari with it looking highly likely Red Bull sister team Toro Rosso will be supplied with Ferrari engines for the 2016 season this seems like the best option for all parties, Red Bull would have a far more competitive and reliable engine, Renault will have the chance to once again show what they can do as a constructor and Ferrari will have another car on the grid powered by them that can take points from Mercedes in the constructor’s championship. Button Hanging Up His Helmet? It has been a season to forget so far for Button with him unable to really compete with any cars on track he has become more a Honda test driver. This drastic drop in performance for McLaren since teaming up with Honda has resulted in a more downbeat and negative Jenson than I have ever seen, this was telling in the interview he gave after yesterday’s race where he did not seem convinced he would be in Formula One next season. Here is what he had to say “That’s something we need to discuss away from the circuit,” “Over the next few weeks, hopefully,”He was then asked if he thought his future was in his own hands, he replied: “I think it’s always in your hands. So hopefully over the next few weeks we can decide either way.” This is a far cry from the Jenson Button we heard last year when his contract was up, back then he was all fighting talk saying he was focused on being at Mclaren for the next year and how much hunger he still had. If we were to lose Button from the grid we would lose a character and genuinely a really nice guy but at the same time it would open up a drivers spot for the impressive Kevin Magnussen who is patiently waiting in the wings. 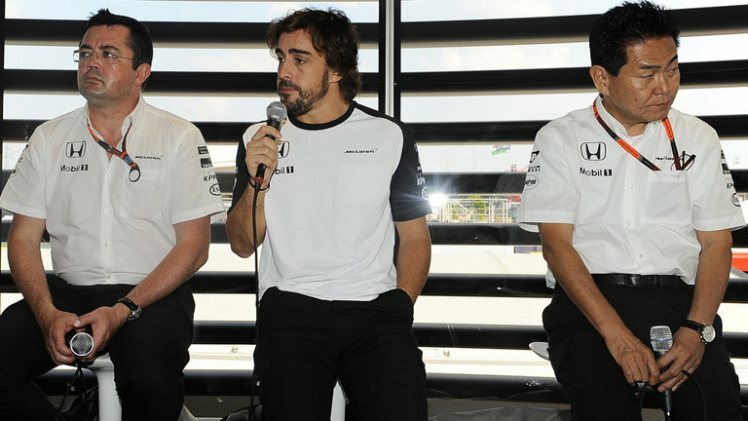 I personally would like Button to stay for at least one more year, I feel his patience and understanding of McLaren’s plights has earned him the right to have one more go. We wait with bated breath. Are Pirelli Worried The Integrity Of Their Tyre’s? Since the dramatic blowout on Sebastian Vettel’s car at the Belgium Grand Prix 2 weeks ago questions have once again been asked of Pirelli and the structural strength of the tyres they are supplying the teams. Fuel was unintentionally added to these flames when Pirelli decided to bring in a minimum pressure guidelines where teams would be punished by the FIA if they were found to have under inflated their tyres, this rule almost cost Lewis Hamilton his win. Where this rule should have stopped the pressure Pirelli has been under this in fact lead to tougher questions being asked and with it being implied that the drivers have been asked not to bad mouth the tyres or Pirelli directly I am left with a bad taste in my mouth. Drivers should be allowed to say what they want in regards to tyres, if they are not happy spectators should know. I would like to see the re-introduction of tyre wars where tyre competitors fight to supply each team with race tyres directly this will make for far more result variation and may give Pirelli the kick they need to produce both a structurally sound and high performing tyre. The End Of Rosberg’s Title Challenge? A DNF for Rosberg and an emphatic victory for Hamilton has seen Rosberg fall 53 points behind his team-mate with only a handful of races to go, he now also have Vettel got on his tail now only 21 points behind. Monza was tipped as being a make or break race for Rosberg and unfortunately it seems as though that is his season broken. Despite bouncing back time after time last season I cannot see the same hunger and desire that I saw from him last season, Rosberg came back fighting after suffering set backs last season and by the end had secured more pole positions than his team-mate as well as pushing the title race right to the final round. Unfortunately for him and Rosberg fans this season has seen him fall further and further behind after every set back, currently losing 11-1 in qualifying to Lewis and unable to challenge him in the race. I do not see where Rosberg can find the points he requires to realistically challenge a maturer, more focused and settled Hamilton, for me Hamilton has elevated himself this season and Rosberg has stood still which is the difference between being a world champion and just falling short. Honda More Powerful Than Renault? Honda Motorsport Chief Yasuhisa Arai suffered an intense grilling from the media on Saturday where he was forced to defend his comments relating to him saying that the Honda power unit actually had 25 more horse power than the Renault one despite McLaren being 11 mph slower than the slowest Renault powered car on the grid through the speed trap. With it being proven how much slower McLaren were through the speed trap Arai suffered further question about where he got the 25 horse power difference from and he had this to say “I didn’t say that exact number of 25, but I talk with other engineers at other teams so maybe it [the number] is not so different we are better than the Renault,” he said. “But I don’t know the exact number.” Defiant comments there from the Honda man which you can say are either foolish or bullish, either way Honda are failing to produce the power needed to move McLaren back up the grid. With increased pressure on Honda to get outside help I cannot see Arai lasting the duration of next season if things do not improve, for his sake he will be hoping the “weak” point they have located in the power unit is the main problem and next seasons power unit will be more on song. Once again we are left with more questions than answers following a race weekend, then again it wouldn’t be Formula One without secrets! Older PostCould this be the best TV ad ever?